The demands of racing can place equine athletes under varying degrees of stress. That’s why our Ph.D. Equine Nutritionists and Veterinarians developed a performance horse feed that meets the energy demands of elite athletes with special additives to provide optimal support when your horses need it most – during times of stress. 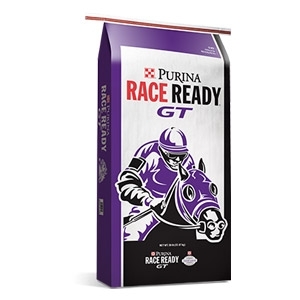 Purina® Race Ready® GT horse feed is formulated to meet the nutritional demands of race horses and helps support proper immune function and a healthy gastric environment.View Guaranteed Analysis and more information on this product.